for Free Thinking & Voluntary Decisions. Fascicularia ( Fass-sick-you-lare-ee-ah ) are a genus with just 2 species. The plants are robust and leathery leaved. 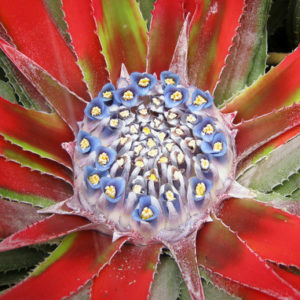 Fascicularia are native to Chile and grow at high, alpine altitudes and survive the Winter covered in snow in sub zero temperatures. Prior to flowering, they begin to ‘stain’ an intense blood red color that makes them look like they are blood soaked and bleeding, hence the name we gave them. Botanical Archetype – VOLITION, Voluntary thought processes or ‘free will’. Root Issue – COMPULSION, Compelled by automated thought processes. ‘Bleeding of the soul’ that compels you to act out your deep hurt. Compelled to fulfil old vows, sworn oaths and promises made long ago that may not currently be relevant, realistic or practical. Automatic behaviour or directives that were not consciously initiated. Primary Emotion / Emotional Symptom – COMPULSION / LACK OF CLOSURE. + Close, Complete, Fulfil, Ending, Free Thinking, Voluntary, Volition, Free Will. – Sacred Contract, Promise, Broken Promise, Oath, Vow, Desire, Want, Craving, Compulsion, Automatic Behaviour, Involuntary. Lesson – You have free will. In this moment, you have free will. Fascicularia help to end thought patterns that were initiated long ago and are now no longer relevant or required. 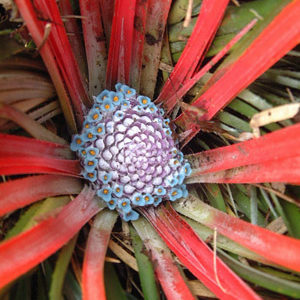 Fascicularia help you to ‘close old chapters’ of life so new ones can naturally occur. Fascicularia help to realize that the human mind is not designed to ‘hold thoughts’, only to ‘have them’. This includes ‘positive’ thoughts, goals and dreams that if unlived, may one day become a burden to you. 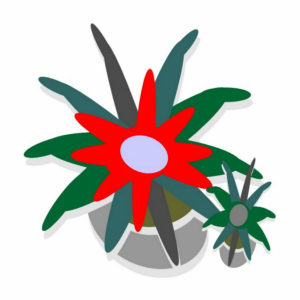 This is the botanical symbol for genus Fascicularia. It is found in all of our books, clinical manuals, flower notes and charts.